Shotgun Shell 12 Guage Pocket Knife | BUDK.com - Knives & Swords At The Lowest Prices! These new shotgun shell knives look just like authentic shotgun shells. Each with a 1 3/4" stainless steel blade and impact-resistant shell material. The blade folds for easy carrying. I bought this knife to put in the elastic shell holder on my NEF 12 gauge shotgun stock. It looks like a real shotgun shell and only I know the difference and this knife will gut a rabbit or squirrel, easily. It is amazingly of good quality and though the blade doesn't have a lock it still is tight and very sharp. It's a functional extra knife that goes where ever my shotgun goes and I bought a red one to go in my survival pack. I do not consider them novelty knives but rather working knives. My knife doesn't look as dark green as the picture, also it looks kind of cheaply made, but it is still a good buy and I look forward to keeping it. I bought this off a whim, it looked fun. and guess what? I was right! 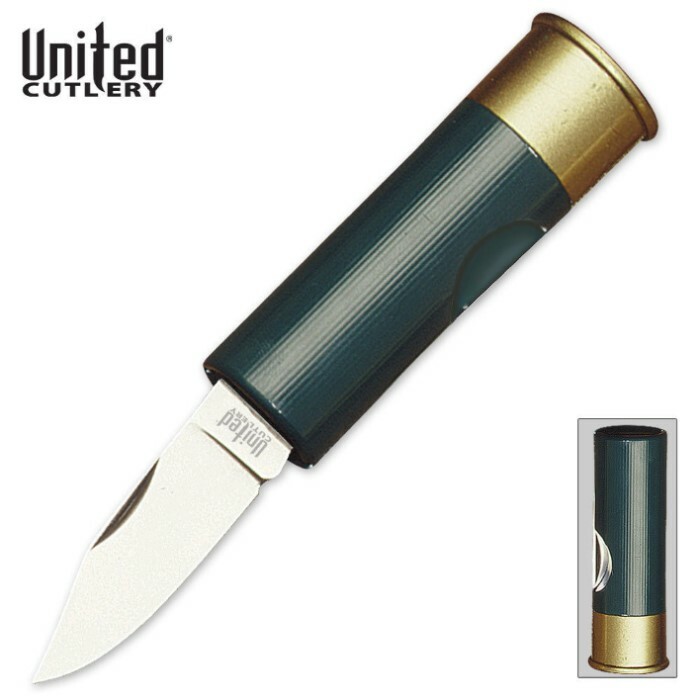 its a simple folding knife that looks like a shotgun shell, not much else to explain, it is a little bigger than the average shell, but thats not a big deal. Overall this is a fun item from Trueswords. Great for birthdays or stocking stuffers!